Video opens a window on worldMy exploration would become the book “Guns on the Internet: Online Gun Communities, First Amendment Protections, and the Search for Common Ground on Gun Control,” forthcoming in August 2018. A gun enthusiast on how to bump fire without a bump stock.This realization led to the question - is it worth it to pass a law, as Florida recently did, banning the sale of bump stock devices, when people can just make and upload a how-to video of bump firing without the device? Guns, part of fabric of lifeFor all the noise around gun control versus gun rights, there was a story that was missed by non-gun owners like me: how much these guns mean to those who own them. How to bridge a divideRecent research suggests that individuals can form attachments to media personalities whom they do not know in real life. Watching their videos helped the author empathize with gun owners. ShutterstockViewers should approach their watching with an open mind. They will see a slice of the other’s life in the context of their world. Here’s a hint for a “starter” video (for gun control supporters) to get the process underway. And for gun rights supporters, this. Dr. Fraser is the President & CEO of New Knowledge Organization Ltd, and a Fellow of the Media Impact Project at USC Annenberg Norman Lear Center. This is the second in his series of guest blogs on social media use among millennials. In a previous blog, I described our national study of teen gamers, It’s not who I am, it’s what I do indicating that the study had broken new ground in that we found that most high school-age “gamers” were not all-consumed by their media tools, but set aside a reasonable amount of time and energy for digital experience as part of their identity development process. What was more revelatory in that study was that teens were choosing their digital gaming to reinforce their ability to achieve success. Those who were more successful in science-based academic pursuits were more likely to use their digital gaming in isolation to advance their mastery, while those youth who were less academically successful with science were more likely to collaborate as a way to be successful. Six years after we started those studies of high school students, we’re in the middle of a different study in collaboration with The Media Impact Project at the USC Annenberg Norman Lear Center. Our research team has been working with PBS NewsHour to study how early career adults under age 35 are choosing to engage with media news consumption, with a specific focus on science, technology, engineering, and math (STEM). In that process, we’ve been debunking claims based on academic definitions of success where prior generations succeeded in school. These claims might simply reveal generational prejudice too. The evidence we’ve collected on early career adults suggests that claims of social media destroying learning as we know it are unsupported. But it’s not only audiences that are changing. News makers’ practices are evolving too. Our results show that the news producers are caught in a complex battle between traditional best practices for broadcast reporting and acknowledging how young adults now consume and interact with media content. Traditional journalism practice expects a reporter and producer to collaborate on finding information to tell a story. New journalism is now being produced as a public, transparent enterprise, with tentative information appearing online and then followed by reasoned synthesis and revision – all in the public eye. Newspapers have been slow to adopt the developing news-making approach, with newspapers of record like the Guardian being first to publish timelines of breaking news on their web portal. Meanwhile, outlets like Huffington Post have been allowing story revisions and tracking those changes to show the process. And quite recently, the likes of the New York Times and Washington Post are following suit. In the broadcast community, however, the opposite can be said to be true. Twenty-four-hour news stations such as MSNBC and Fox News use constant repetition to announce facts recapitulated by reporters, who often simply reinforce the station’s political biases. Today, new media and the wash of information has created a new learning ecology for news consumption. Early career adults expect participatory dialogue surrounding their news media. They anticipate that information will be shared, negotiated, and challenged. It is the engagement in discourse that helps shape their understanding of validity in contemporary media consumption. Young career adults are not as cynical as reports about social media would suggest. Rather, they are more media savvy in what they choose to accept, have less willingness to listen to thoughtless recapitulation, and imagine themselves as editors sorting through the wash of content to remain abreast of topics. The dialogue itself is part of the spectator sport of media consumption today. Social media is an exercise in editing, filtering, and culling information. It appears that success with journalism in the coming era will focus on becoming a more responsive community to engage and find relevance. STEM stories, and all media, in the next wave of reporting will be more about existing as part of social media dialogues than simply broadcasting and moving on to the next spectacle. Is Social Media the New Rock n’ Roll? Dr. Fraser is the President & CEO of New Knowledge Organization Ltd, and a Fellow of the Media Impact Project at USC Annenberg Norman Lear Center. His series of guest blogs on social media use among millennials will appear each Monday for the next three weeks. Op-ed pieces about the cost of social media to civil society tend to be reinforced by an age-old trope that young people (no matter what generation) are enamored with their new technologies but have increasingly lower attention spans never before seen in human history. Rock and roll was supposed to lead to the demise of society in the 1950s, almost the same way that fast cars and sexualized clothing of the 1920’s were assumed to be evidence of the end of western European civilization. It seems that social media is the new rock and roll. As new social media emerged, academics perhaps not raised with these technologies invested in a rapid-fire process of pathologizing digital behaviors. They often characterized failure as an inability of users to succeed in traditional learning modalities. It was those modalities – single-task execution or concentration in a classroom – where academics were rewarded in their own careers. They studied game addiction, comparative loss of single-task attention skills, and how social media negatively impacts academic performance. While some studies were hopeful about the value of digital tools in society, the negative public reports far outweighed the positive. In the face of that work, our national study of teen gamers, It’s not who I am, it’s what I do broke new ground. We found that most so-called high school-age “gamers” were not all-consumed by their media tools. In general, youth had set aside a reasonable amount of time and energy for digital experience as part of their identity development process. What was more revelatory in that study was that teens were choosing their digital gaming to reinforce their ability to achieve success. Those who were more successful in science-based academic pursuits were more likely to use their digital gaming in isolation to advance their mastery, while those youth who were less academically successful with science were more likely to collaborate as a way to be successful. It is only in the past few years that we’ve seen an abundance of affirmative studies that consider how social media is changing the way we think – not better, not worse, just different. We’ve labored too long on the assumption contemporary youth have low attention spans, when it’s now becoming apparent that most youth are simply exercising good judgment on how to use their time effectively. MIP Editor’s Note: Journalism can and does spur real change. The following two stories by our MIP guest blogger outlines how two reporters spotlighted serious problems in government agencies and helped initiate improvements. The first is a heartbreaking story involving the overwrought Child Protective Services in Rochester, New York, and looks at coverage that persevered for almost two years. The second piece hails from the TCPalm in Stuart, Florida following Hurricane Irma. It looks at how one reporter’s coverage of inefficient bureaucracies inspired an overnight environmental clean-up. One long-term, one short, but both stories proving the power of local journalism to change lives. For the next year and a half, McDermott stayed on the story as investigators declared 3-year-old Brook Stagles’ death a homicide, her little body bruised and broken inside and out; as Brooke’s grandfather pointed a finger at Child Protective Services; and then as the child’s father and his girlfriend, Erica Bell, were charged. She sat through Bell’s entire trial. She investigated CPS. Within days of Bell’s criminal conviction in October 2017 — almost a year after McDermott picked up that general assignment shift — Monroe County Executive Cheryl Dinolfo announced sweeping changes to the county's Child Protective Services agency. “His story from the beginning was much more focused on failings with CPS,” McDermott said. “My reporting later determined it probably didn’t have a direct impact on her death. Erica Bell (did). But it did make me interested in whether the system working as it should, and my reporting found it wasn’t.” McDermott collected data on CPS cases and deaths, including documents showing caseloads in Monroe County were some of the largest in New York. “Usually you’d want caseworkers to have 12-15 cases a month, but some workers here had in excess of 50 a month,” McDermott found. Monroe was 54th worst of 60 counties in overdue investigations, 40th worst in number of workers with more than 15 investigations. Anjanette Delgado is the senior news director for digital at the Detroit Free Press and freep.com, part of the USA Today Network. The Democrat & Chronicle and TCPalm are also part of the USA Today Network. Email: adelgado@gannett.com, Twitter: @anjdelgado. A year ago, MIP Senior Fellow Jessica Clark unveiled a hands-on tool for helping media makers and funders map outcomes of a project: the Media Engagement Strategy Deck. 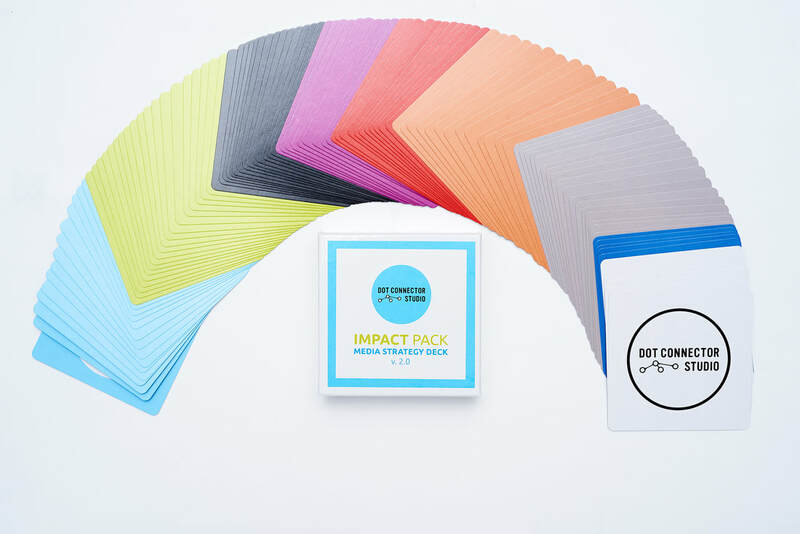 Clark designed the cards to help producers and funders conceptualize the trajectory of an engagement campaign, and then use the decks to talk to their teams about project goals, shared outlooks, and differences between the two that might exist. The cards are meant to be flexible and reflect the many different creative approaches that media makers are taking to draw communities into issues. MIP checked in with Clark during this anniversary season to learn about the deck's reception among her colleagues in nonfiction storytelling, academia, funding and beyond. We wanted to learn about the different contexts in which the cards are being employed and whether they are proving useful. The range of places and organizations employing the Media Engagement Strategy Deck include: among media makers at AFI Docs and Double Exposure; at funder gatherings such as ComNet and Philanthropy Workshop; in classrooms around the globe, including Central European University, the University of North Texas and SUNY Purchase; by journalism outlets and conferences such as Capitol Public Radio and the Online Newsroom Association; in media venues overseas, such as the Jakarta Global Forum for Media Development; with PhillyCam, a media literacy training program, and in one-on-one sessions with funders, researchers and media makers. The cards are also being adopted more rigorously by some groups: The Solutions Journalism Network has worked them into their training curriculum, and Greenpeace International’s digital trainers have ordered several decks. Want to try the cards for yourself? Purchase decks here.